Donley Service Center of Phoenix is the “Best Contractor to Work for” an honor from The Air Conditioning, Heating, Refrigeration NEWS, the premier publication of the HVACR industry. A feature on the company appeared in the Jan. 31st issue of the magazine, as well as on its website. HVACR (heating, ventilation, air conditioning, refrigeration) contractors who rise to the top of this competition have shown their ability to attract and retain top employees, by providing ample training, steady work hours, trust, benefits, and a sense of community and even family responsibility. 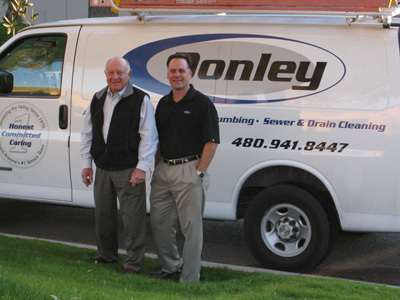 Like many others who work in HVACR, James Donley, founder and chairman of Donley Service Center, and president Mike Donley, have both spent much of their careers focusing on building employee and customer relationships that are based on trust and respect. Taking that trust and respect to the next level of uncompromising integrity, however, sets James and Mike apart as The NEWS’ contest winners in the Western region. Winning in the annual contest has become a status symbol among HVACR contractors, and it helps them attract “the best of the best” among the pool of qualified HVACR technicians. For more information on the contest, visit www.achrnews.com. For more information on Donley Service Center, go here. This entry was posted in blog and tagged AC, AZ, cooling, donley, DONLEY SERVICE CENTERS, heating, mike donley, phoenix, plumber, solar. Bookmark the permalink.